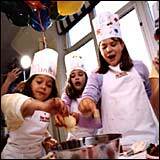 The buzzword in birthday parties is creativity, whether spending an afternoon at cooking school or learning a magic trick from an expert. What's cookin'? : Party at the Institute of Culinary Education. She swore it wouldn’t happen to her. Julie, who favors Birkenstocks over Prada, sat at her baby shower a dozen years ago insisting that the more-bigger-better attitude of the eighties would have absolutely no influence on how she would raise her firstborn. And when Katie was born, the first year was all about breast milk and cloth diapers. The at-home 1st-birthday celebration was low-key, with the Grateful Dead in the background, veggie burgers, and bowls of trail mix. The strongest-willed among us may hold out for the homemade cake and pointy party hats for a few years, but eventually, the kids themselves catch birthday-party fever. Chelsea Piers, which sprouted into a birthday-party mecca soon after it opened in 1995, has some 1,800 parties a year, offering an irresistible range of sports-oriented activities, from rock-climbing and soccer to inline- and ice-skating. Same for Central Park: Linda Kaye’s Birthdaybakers Partymakers, the company that landed the plum contract to handle all parties at the zoo, reports about 250 per year. And newcomers to the birthday-party marketplace crop up all the time. The folks behind Karma Kids Yoga, a new downtown yoga studio for youngsters, realized they could market their weekends for yoga birthday parties. No headstands here. Instead, kids lumber around the room swaying their elephant trunks and swish from side to side in the not-so-Kripalu pose the washing machine. Kids who want more rah-rah than Om make their way to the Family Disco in midtown, which opened last fall. Britney and Justin wannabes cut a rug on the hardwood floors at Jack Rose, while parents sidle up to the bar. Funny business: Some magicians like David Kaye are always in demand. On the Upper East Side, Creatability opened last year as an arts-and-crafts studio; founder Ilyse Rothman soon offered the space for birthday parties and went one step further by taking her show on the road. A mobile Creatability, supplies and all, can travel to a birthday party anywhere in the city. During a two-hour shindig at the Institute of Culinary Education, kids don chef’s attire and prepare a main dish—from an easy pizza to a complex sushi platter—all from scratch. Each guest leaves with his or her own decorated cupcake. Sports-related parties are also very big these days, particularly, but not exclusively, with boys, who choose a handful of friends and a beleaguered dad or two and head off to Shea or Yankee Stadium or the Garden for a game and as many boxes of Cracker Jack as said dad is willing to shell out for (at $4 per). Home-based parties have all but expunged musical chairs and pin-the-tail-on-the-donkey from the birthday-bash scene. Broadway-caliber magician Arnie Kolodner brings revamped fairy-tale shows to the party, complete with scenery, costumes, and very cool prestidigitation. Kids go home with a goody bag of magic tricks they can do themselves. For horror-themed birthday parties, which tend to be the domain of 10-year-old boys, Dr. Blood is the man of the hour. Magician David Kaye shows up in a fake-blood-stained lab coat and proceeds to cut the birthday boy in half. One Upper East Side mom took the idea of the at-home birthday party to unforgettable heights. The week before a complete demolition and renovation of her East Side apartment, fourteen 11-year-old girls celebrated her daughter’s birthday by painting anywhere and everywhere they pleased. Prizes were awarded for the most creative work.